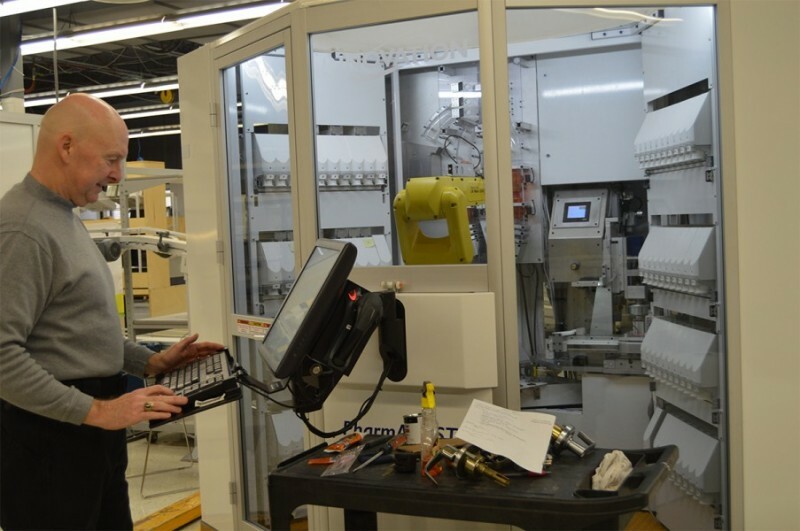 Phil Samples, vice president for professional services for Innovation, demonstrates one of the firm's dispensing units that takes a prescription through all of the steps necessary to dispense it. Phil Samples is vice president for professional services for Innovation, a pharmacy automation and process optimization firm in Johnson City, N.Y. The firm’s website notes that it is ‘helping pharmacies increase efficiency, enhance patient safety and deliver patient-facing care’ – and that message comes across loud and clear from Samples, who serves on the Advisory Board for the School of Pharmacy and Pharmaceutical Sciences (SOPPS) and its Communications and Marketing Committee. He is also a preceptor for the school. With a PharmD from the University of Georgia, as well as a bachelor’s degree in pharmacy and two master’s degrees, Samples joined Innovation five years ago after nearly four decades as a pharmacist, much of that with the U.S. Air Force. Samples and Innovation are strong proponents of SOPPS, and believe they can bring something different to the school – training in an area that pharmacists, to this point, have not received. As the partnership between SOPPS developed, the school needed an option for its dispensing lab, and Innovation said, “We can handle this,” Samples said. “We’ve been able to work with the school in the temporary location for the first phase, providing computers and the necessary software. Our system handles all the steps to process prescriptions, so they’ll have the total experience prior to encountering patients.” In all, Innovation is providing more than $40K in equipment for SOPPS. The scalability of the solution to fit any level of need is the key differentiator that sets Innovation apart from competitors, but another fits into Binghamton University’s focus on interdisciplinary education. Samples is looking forward to working with the students who choose the Innovation site for their program. “They need to get all their required rotations taken care of, those are fundamental and this is an elective, but this is a great opportunity.